After successfully completing training, you will enter as Probationary Member of CMU EMS. You will respond on calls like any other member but will be under the constant supervision of a more senior member. As a Probationary Member, your job is to develop your medical and communication skills by practicing what you have learned, interacting with patients, and observing how calls are run. As a Probationary Member, you are required to begin pursuing certification as a Pennsylvania State Certified Emergency Medical Professional. The lowest certification level, Emergency Medical Technician, is offered by CMU EMS as a class that runs from mini 2 to the end of the spring semester. Once you have completed and passed the class, as well as passing a set of additional criteria, you will be promoted to Responder. This rank means that you are trusted to direct patient care without the supervision of a Crew Chief, although a Crew Chief will be present for some portion of every call. You may work towards becoming a Crew Chief, a member ultimately responsible for all patient care on a call, and finally a Supervisor, the highest possible rank and the member ultimately responsible for all operations on a shift. On a typical day in EMS, you can carry out your normal activities, but must be ready to respond to emergencies at a moment's notice. This means that you must carry your radio and equipment with you at all times and remain on campus. Members are not required to miss class for EMS responsibilities. Emergencies on campus range from sprained ankles to heart attacks. You will probably be dispatched to a call one or two times during a shift; however, there are often shifts with no calls at all or with many more calls. A shift lasts 24 hours. All members are expected to give a minimum time commitment of two shifts per month and to attend monthly general body meetings. 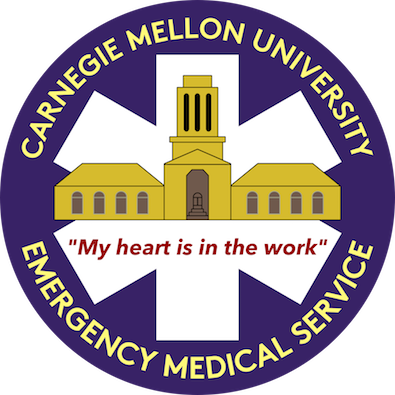 If you are interested in joining CMU EMS, please read about the application process.